The ideal gift for your pet-owning friends and relatives! "We'd like to thank all the staff at Friars Lane for their consistently kind and thoughtful treatment of our dog and for their consideration and kindness. Many thanks to you all." "The staff are very nice, the vet we saw gave us plenty of advice for both of our dogs. 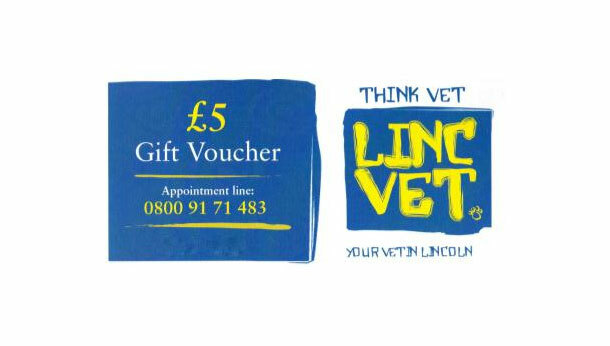 I have booked our little dog in for her neutering in the summer and am confident she will be well looked after at Lincvet." "The price for a consultation and prescription was really reasonable. Overall, we were extremely pleased with the service and treatment we received. This will definitely become our regular vet surgery. Great job." "The staff and vet were lovely, very caring and compassionate." 43 Friars Lane, Lincoln, LN2 5AL. Birchwood Neighbourhood Shopping Centre, Birchwood, Lincoln, LN6 0QQ. 270 Wragby Road, Lincoln, LN2 4PX.